Web Monitor can help you monitor any number of Web site links to ensure they are alive and kicking, and more importantly, returning the results you actually expect. Web Monitor can watch an unlimited number of Web URLs and notify you via email or SMS on your phone if and when there is a problem. It can even launch another URL or execute a file to correct the problem without manual intervention when a failure occurs. Web Monitor can also notify you again once the site comes back up, so that you can relax and back off from full panic mode at 3am in the morning. 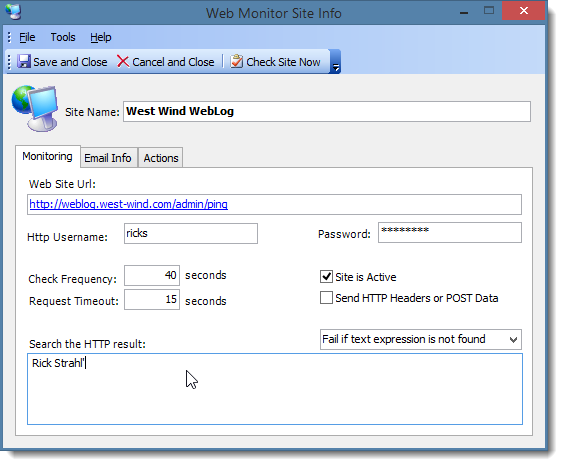 Use Web Monitor for site health monitoring or for notifications when URL content changes. There are lots of uses for this easy to use, yet powerful tool. 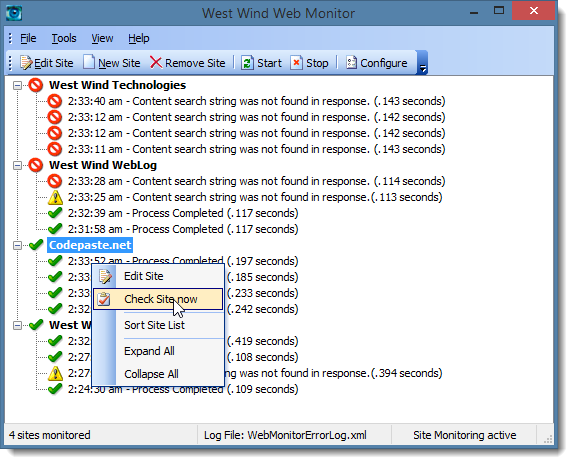 Web Monitor is a Windows application that can run either as a desktop application, tasktray item or as a full Windows Service. The Service version also provides a remote Web administration interface to administer the Web Monitor Service over the Internet (requires IIS and ASP.NET 4.0 or later on the host machine). So what are you waiting for? 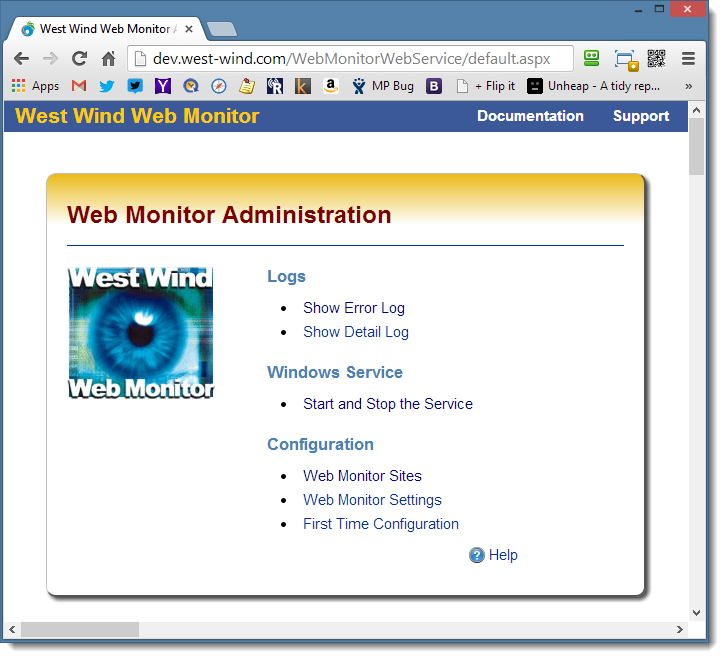 Try out Web Monitor for yourself today for free! to plug Web Monitor monitoring engine into your own .NET applications. Want more information? Take a look at the online documentation available with features walk throughs and developer documentation. Or take Web Monitor for a spin by downloading our fully functional shareware version. Don't let your Web Site keep you up at night! To configure a site for monitoring you simply add a URL and specify the frequency of monitoring. You can optionally provide a username and password for the URL and a search string to locate in the URL to look for - if the search string is not found the request is considered failed even though it completed. The contact info page allows you to specify email information that is used to contact you when a server goes down. You can enter an unlimited number of email addresses and provide info on your mail server email send options. Here I have an email address as well as a cell phone email box to get notified of the failure. Mail Server and other configuration options are configured separately. You can run both quick and slow recurring links through Web Monitor. For example, I like to run a number of Web based maintenance tasks that happen once a day through Web Monitor. Web Monitor can be configured to run requests at long intervals which amount to running a request once a day or once a week. Activity of Web Monitor can be viewed directly in the user interface or you can use the Log Viewer to view both Error and Detail Logs to get a history of failures and/or all transactions. The application can run as a standalone Exe application or as a System Tray applet that doesn't show any user interface until you click on the tray icon. To launch the app in TrayIcon mode you can run with the -trayicon commandline switch. 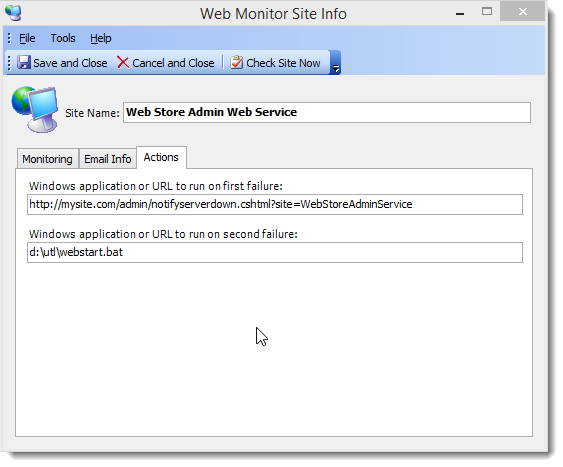 In addition to the running in the Taskbar you can also run Web Monitor as a Windows Service using the Service Version. The Service version also provides desktop functionality but adds Windows Service support and provides a full featured ASP.NET front end for the Windows Service that allows full remote configuration and viewing of the logs over the Internet. The Service version includes an ASP.NET based remote administration Web site that can be set up on IIS directly from within Web Monitor. Assuming IIS is installed you can create the remote manage Web site which allows access to most administration features, like adding/editing/removing of sites to monitor, global configuration and starting and stopping of the Windows service through the remote Web interface. 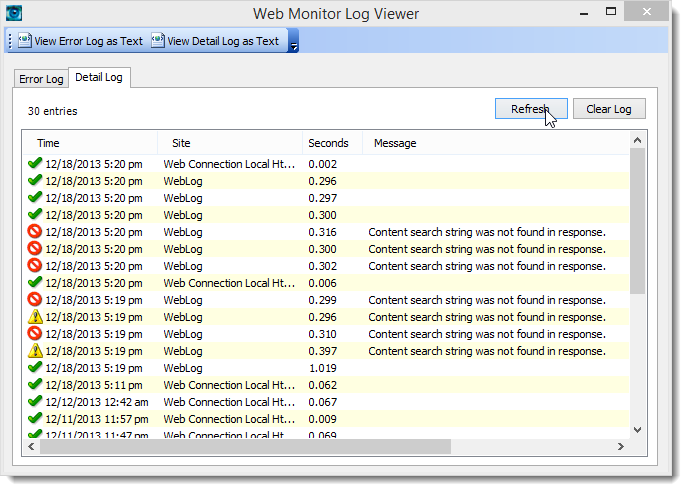 Web Monitor is also optionally available with source code to allow extension of the Web Monitoring functionality. The application is built with modular design for site checking and site list checking that can plug into other applications relatively easily. If you're interested in how Web Monitor works, want to extend its functionality or plug this sort of functionality into your own .NET application, you can purchase Web Monitor with Source Code. The WebMonitorSite and WebMonitorSiteList classes are built in a very modular fashion and can be easily integrated into other .NET applications. The application also includes a number of useful helper classes that simplify many .NET tasks related to retrieving HTTP content. 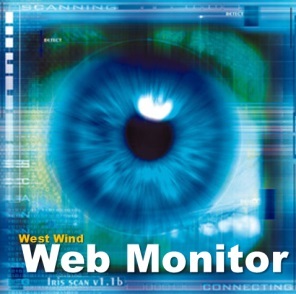 West Wind Web Monitor is distributed as shareware. You can download and try out the software with the fully functional free version. The free version only runs as a desktop application and pops up a nag screen. The Free Version runs as a desktop or task tray application only. All monitoring and management features are available, but the Windows Service and remote Web administration interface are not accessible. The free version is limited to 3 sites and doesn't support advanced HTTP features like Headers and POST data. monitor. 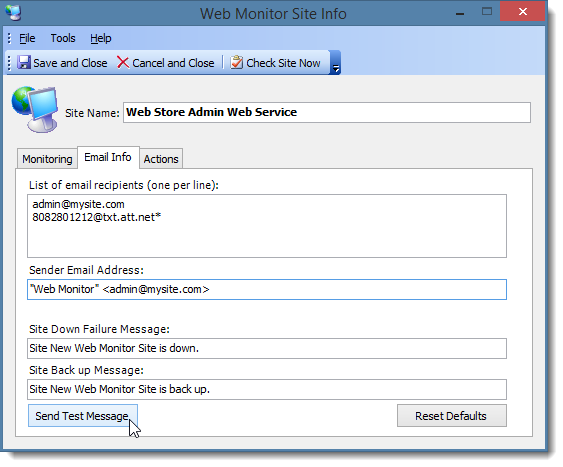 This version is the fully licensed Desktop only version of Web Monitor. It runs as a desktop or task tray application. All monitoring and management features are available, but the Windows Service and remote Web administration interface are not accessible. There are no nag screens and there's no limit to the number of sites you can monitor. This version provides the features of the Basic version, plus the ability to run as a Windows Service and using the Web remote administration interface to configure Web Monitor and view the logs over the Internet. Note the remote Web Interface requires ASP.NET 2.0 or higher on the machine that Web Monitor runs on. Special license that allows the Service Version of Web Monitor on an unlimited number of machines within a single organization. You can register in the West Wind Online Store via secure link with Visa, Mastercard or American Express. For additional payment options please see our pricing pages.